Even if Barry Bonds is not an All-Star this season, Giants owner Peter Magowan expects the slugger to take part in festivities for baseball's summer classic in his home ballpark. Magowan hopes that Bonds' godfather, Hall of Famer Willie Mays, will be a big part of the July event in San Francisco. Yet Magowan would rather No. 25 is in uniform and playing for the NL roster and World Series-winning manager Tony La Russa. "If Willie is going to get honored, as I think he will, Barry will have some role to play there," Magowan said Friday during a wide-ranging interview in the dugout at Scottsdale Stadium. "But what I hope instead will happen is he is chosen to be on the All-Star team, and I feel he will be. I feel he will have earned his spot both by what he's done in the game and by what he will have done this year." Bonds, a seven-time NL MVP, begins his 22nd major league season _ his 15th with San Francisco _ 22 home runs shy of passing Hank Aaron's career record of 755. Magowan joked how La Russa will surely want Bonds on his All-Star roster, a reference to the slugger and skipper meeting during Bonds' brief appearance at the baseball winter meetings in December. La Russa's St. Louis Cardinals apparently were a team interested in Bonds. "We all know from the offseason that Tony would like him," Magowan said with a chuckle. In the case that Bonds isn't voted into his 14th All-Star game, Magowan said the Giants will incorporate their 42-year-old left fielder and cleanup hitter. 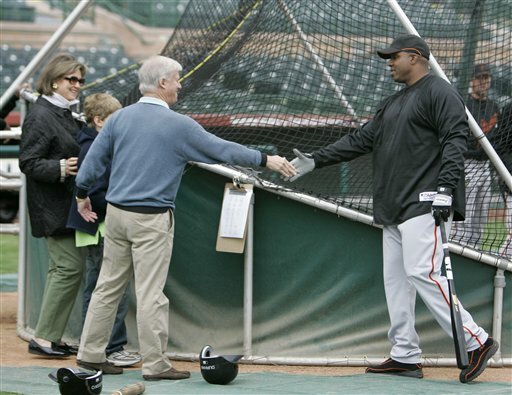 Everyone around the Giants is happy to see that Bonds is completely healthy and in great shape this spring training. Bonds revised $15.8 million, one-year contract was finalized Feb. 13, one week before his first spring training workout. The sides agreed on terms Dec. 7 then spent nearly two months squabbling over complicated language in the deal. Giants general manager Brian Sabean knows Bonds has a good chance to be an All-Star. The slugger hasn't made it since five straight selections from 2000-04. "It wouldn't surprise any of us," Sabean said. Bonds, who had offseason surgery on his left elbow, batted .270 with 26 homers and 77 RBIs and drew 115 walks in 130 games last year after appearing in only 14 contests in 2005 following three operations on his right knee. Magowan expects more production in 2007. Bruce Bochy has said it is realistic to expect Bonds will play in at least 100 games. "I think we're very glad to have Barry," Magowan said. "I think he looks better than pretty good. He looks really good. I think he's going to have a better year than he had last year. Last year he couldn't really move at the beginning of the year. His mobility is much better, he looks a little skinnier and I think he's highly motivated. He's always highly motivated, but he's trained hard during the offseason. I think he's going to have a good year and we're counting on him to." Magowan, with his wife and grandson accompanying him, watched Bonds take his cuts from right behind the batting cage on a cool Arizona morning and they chatted between Bonds' rounds in the cage. Aside from Bonds, Magowan addressed the futures of Sabean and shortstop Omar Vizquel. Both men are in the final year of their contracts. Magowan pledged his support for Sabean despite the fact the Giants have missed the playoffs for three straight years. Magowan isn't pointing all the blame at the GM. He told Sabean they will discuss his situation toward the end of the season _ though Magowan also said he fully expects Sabean to stick around. "I think a lot of Brian," Magowan said. "He's one of the best general managers in the game. We've had two disappointing years. We're all accountable. ... We're all on the hot seat. I'm on the hot seat." Sabean, who said he would like to stay in San Francisco forever, understands Magowan's need to wait. He would do the same thing in such a situation Sabean was in the same situation in 2002 and didn't receive an extension until after the team's World Series season. "It's understandable," Sabean said. "Just look at the last two years. I'm certainly not above going through due process." Vizquel said upon his arrival that he would like a contract extension, and that he hopes to play through 2009. The 11-time Gold Glove winner turns 40 in April. Magowan said something could get done during spring training. "I would like to explore it. Pretty unique guy, Omar," Magowan said, noting it might have to be on a year-by-year basis with Vizquel. "At his age to play the position he plays, shortstop, and to play it as well as he's played it and do it at that age that well, I can't remember the last time I've seen it." Magowan expects the Giants to reach the 3 million mark for attendance for the eighth straight season, every year the Giants' waterfront ballpark has existed. Notes:@ Backup C Eliezer Alfonzo injured a side muscle two days ago on a swing and will be out of action for a few days. ... RHP non-roster invitee Carlos Hines felt something in his shoulder while throwing a bullpen session and won't pitch for three to five days, Bochy said. ... The Giants will unveil a new high-definition scoreboard this season as well as 150 new seats around home plate.